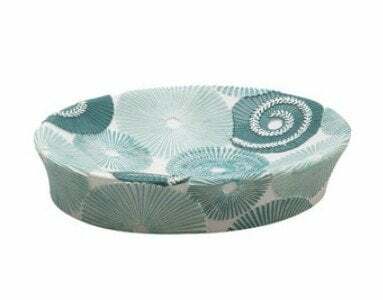 Bathroom accessories like a soap dish are often the last thing you choose when planning a bathroom renovation... the decorating icing on the makeover cake. But are your floor tiles really the best place to get decorating, color or texture ideas? What if you switch it around by selecting your soap dish or soap dispenser first; using those as your source of bathroom renovation inspiration? This post has different soap dishes to choose from as the base for your bathroom makeover, a video to make your own soap and a video to make a soap dispenser from a mason jar! Why use simple bath accessories help you with your bathroom makeover? Simple. A bathroom makeover or renovation is an expensive, time consuming exercise. By focusing on one component, you quickly define the style of your bathroom decor and from there the cost and theme of your bathroom; building from there. The soap dish above is full of intricate detail and texture, which means you can use plain tiles and simple color schemes as a backdrop. It would go so well with dark blue or gray walls or muted soft neutrals. 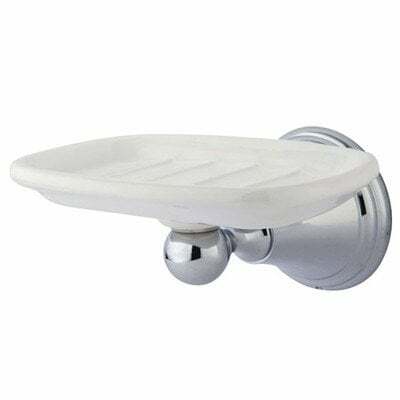 Wall soap dispensers like the one above, save vanity space, which is perfect in a small bathroom. The material you choose makes a difference to how well your bathroom set will wear and how easy they are to keep clean. Take this into account when choosing bathroom accessories in sets. 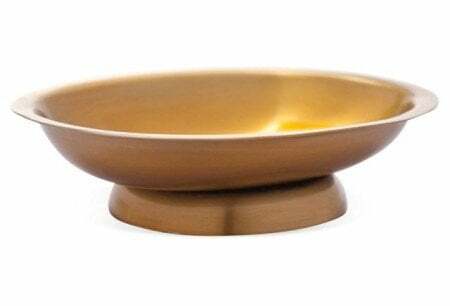 Brass that quickly tarnishes or ceramics that easily crack never look appealing. 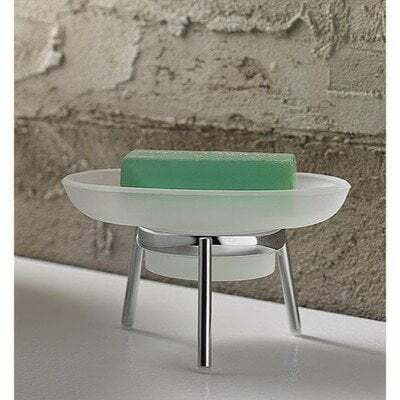 There's simple stainless steel soap dish, bamboo soap dish, glass or wood soap dish or do you need something specific for your bathroom like a corner soap dish, a recessed soap dish or wall soap dish to save space and in keeping with your other bathroom decor? 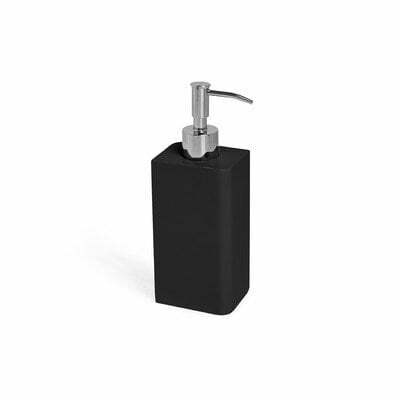 Choosing a soap dish or soap dispenser first can help you plan your makeover faster. 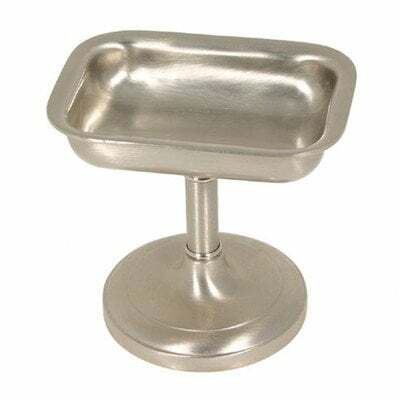 Using it as your anchor, and knowing that you prefer a shower soap dish in brushed nickel or marble, or a ceramic tile soap dish to go with floor tiles can help you pinpoint exactly what you want - instead of leaving it to last and putting up with what goes with everything else. The simple soap holder above is easy to clean and elegant with its short stand. From simple white to coastal blues, it could look great in many bathrooms. A benefit of freestanding soap dishes is that unlike wall units or soap dispensers, replacing them is not such a huge issue. Simply remove and replace with something else in a new style or color. 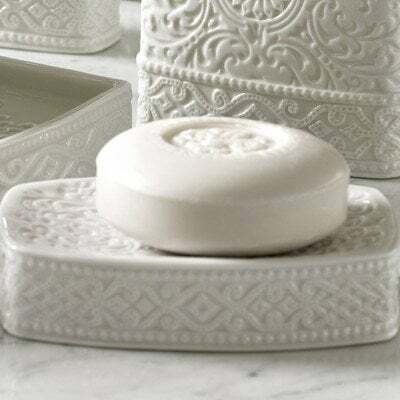 You can build a new story around your soap dish or dispenser in seconds with matching bathroom accessories like a bathroom rug, towels and other bathroom decor including your vanity, storage and task lighting. The tripod holder above is more modern so more clean lines and less warm terracotta tiles are needed, so it doesn't look out of place. 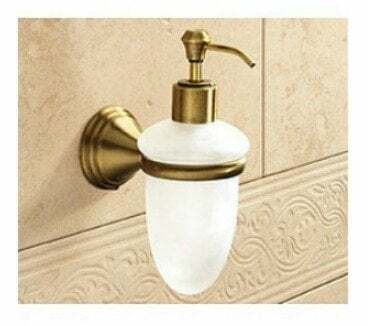 The glass soap dispenser below is transitional but could work in many bathroom makeovers. People build their dream bathroom and only then ask,' what kind of bathroom accessories go with this?'. Watch this video to get more ideas. 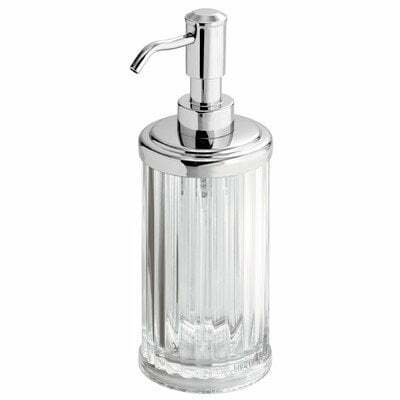 These days soap dish and soap dispenser are made in many materials and styles; including wall mounted models in polished steel, nickel or brass, tripods, black stone or clear glass. The dish below has beach cottage decor written all over it. The matte black dispenser below would look great with matching tiles. Which style speaks to you? What about a wall mounted soap dish that glues on and can be easily removed? Soap dispensers and dishes are probably the least expensive item in your bathroom renovation, making it an easy way to create your bathroom and there are hundreds to choose from. To finish this post, here is another video to make your own liquid soap dispenser using a mason jar! Fun for any bathroom! Join our free email list to get copies of DIY Cheat Sheet and 42 Interior Decorating Secrets.